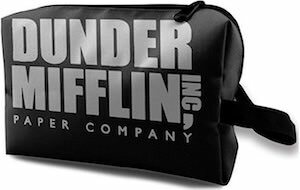 If you need a towel for The Office then you should check out this Dunder Mifflin beach towel. The Office beach towel is white on both the front and the back and on the front it is covered in the Dunder Mifflin logo. The towel is big at 74 x 37 inches it is the perfect size for a day at the beach or a visit at the pool. 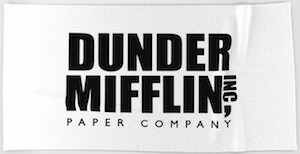 So get the message out where you get your paper goods from and this Dunder Mifflin logo towel will make Micheal Scott and his staff really happy. 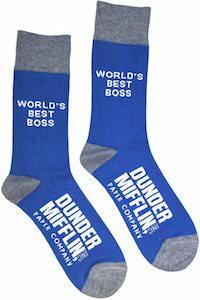 If you like The Office and need warm feet then you should check out these Dunder Mifflin Best Boss socks. These socks are one size fits most and will look great on men and women. The socks are blue with light grey top edge, toes and heel and then on the bottom of the socks it has the Dunder Mifflin logo and on the sides of the socks it says “World’s Best Boss” and that means that these are actually the socks of Micheal Scott. The Office socks are made from 77% Cotton, 21% Nylon, and 2% Lycra and are officially licensed socks. Do you need the perfect mug for your hot beverages? Check out this great mug, from the awsome and hillarious television series The Office. 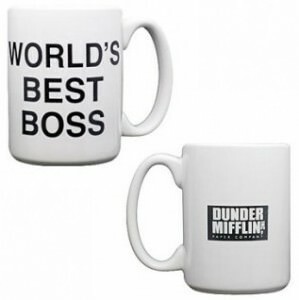 This mug features the company logo “Dunder Mifflin Paper Company” on one side of the mug, on the other side you will find “WORLD’S BEST BOSS”, this is a saying that Michael Scott the boss at the office would usally use…refering to him self. Made of ceramic this mug is dishwasher safe and microwave safe.